The sacred temple of Lord Venkateswara is situated on the Seshachala Hill, which is one of the seven peaks of the Tirumala Hills. The atmosphere is cool and sanctified with the echoes of divine chants. 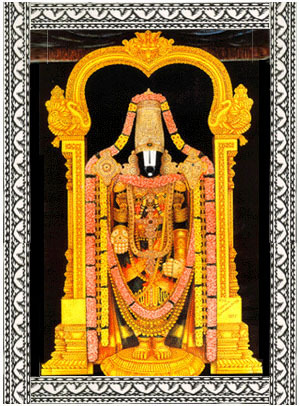 Lord Venkateswara the presiding deity of the Tirumala Hills, Tirupati is undoubtedly the One who will grant Mukthi (eternal freedom) to those who worship him. Picturesquely situated on top of the Tirumala hills, this temple is reputed to be one of the most ancient temples in India. Lord Balaji, as he is also affectionately referred to is also worshipped by millions of devotees for prosperity of their business venture. Everyday is a festival day in Tirumala. To help you perform poojas here we offer two packages. 1. One Double Bed Air-conditioned Room for one night will be organised at HOTEL BHIMAS PARADISE - TIRUPATI, a well reputed vegetarian hotel. Food will be extra on actuals as charged by the Hotel. 2. Apart from the above any special daily/annual UTSAVAM, or weekly/annual seva like Kalyana Utsavam can be organised subject to availability as confirmed by the DEVASTHANAM and at additional actual cost as charged by the T.T.D.